Farmgirl Fare: Daily Farm Photo 7/17/06: Knock, Knock! How can you resist those ears?! Surely you let her in?! I can just hear her saying "puh-LEASE?" I have just discovered Carey!!! I love her. Maybe it's because it's approx 110c in my bedroom and all I want to do is sleep or perhaps I have a great deal more on my mind than I thought, but Carey being abandoned TWICE made me weep into my laptop. Thank goodness you were there for her. The heroin of this story. I know I have said this before, but thank you for your blog Farmgirl. Oh how funny.....it's amazing how smart our critters are. And how could you say no to that sweet face. That is just too funny. I thought my dogs were spoiled. This is going to one hard to break habit, but who could resist that face and those cute little ears? Awwww poor little sweetie must be so hot wearing that wool coat. She is so terribly cute; I love the pictures and the updates. Oh so cute. I could not have been able to not open the door and then make some snacks. I wish Cary would come knocking at my door ! "C'mon mom, you've set a precident! Now I KNOW I'm allowed in! C'mon c'mon c'mon!!!" Awww - how cute. I KNOW you let her in. Thank you for finding the web site with all the local farm information. I found a great couple not too far from my area and got some of their spectacular berries. I also got a good story from it. We walked into the shed to get the berries from a refrigerator, and the guy pulled a key ring out of his pocket and un-did the padlock on the fridge. I tried to hand him my twenty, but he pointed to a bag sitting on a desk and told me I could get my change from it. So the berries were locked up, but I was free to dig around in his big bag-o-money. I love country life! It reminded me of the farm in Indiana where I used to get my pumpkins. There was just a box nailed to a tree and that's where you put your money. Oh now that is just too funny. ;-) I'm going to have to get a photo of my Percheron peering through the living room window. He got out of the pasture one day, I looked up from what I was doing and - whoaaaaaaa! Very large surprise. Honestly, you made my day with this one. Well, of course she wants to come in! And how could you resist her adorable face? And I want a dog?! 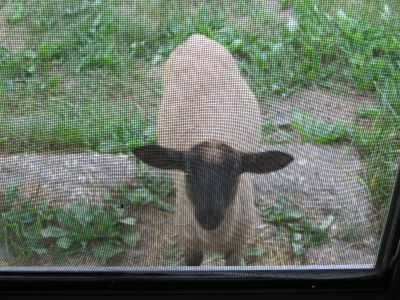 What I wouldn't give for a sweet little lamb to come knocking on my screen door. Granted, I'd have to have a screen door, but whatever. Great photo -- she is such a cute little peanut. that is so cute it needs to be on cute overload! good lil carey. is she house trained? I see that look a lot, only around here it's usually on the face of a dog, cat, or duck. This picture is fantastic! She looks like our dog, who has giant ears that stick out sideways - sometime I will post a picture. Love your writing - you definitely have to do a children's book!